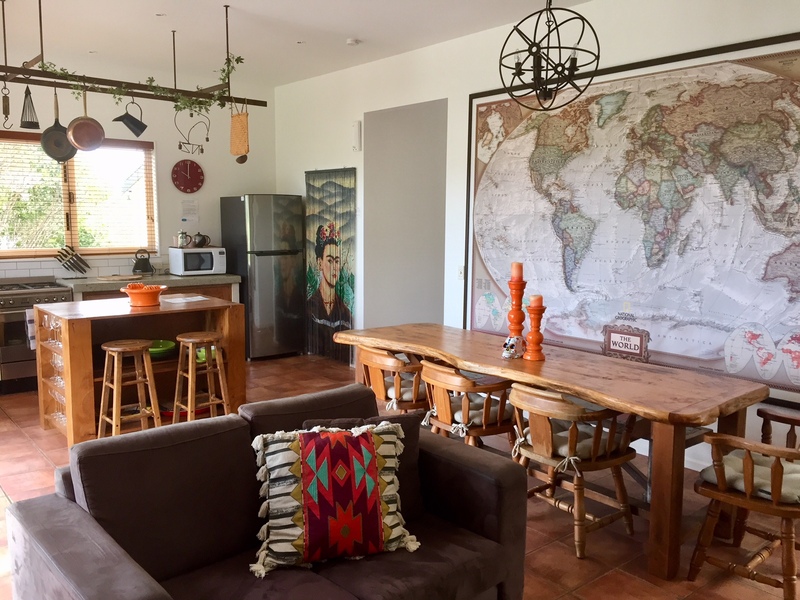 Amigos is a spacious single story home with a hint of Mexico colour and charm. Open plan kitchen, dining and lounge area is perfect for entertaining, with “walk out onto” options of either a large sun filled deck or sheltered BBQ area. Relax and enjoy the ambience of Waiheke. There are four bedrooms comprising two Queen bedrooms, one Twin Single room and one Twin King Single room, sleeping a total of eight guests. The villa has a large tiled bathroom with a separate bath and shower. Located in Surfdale, Amigos is a less than ten minute stroll to Surfdale Village where you will find, Stefano’s Pizza Restaurant, Frenchot Café & Restaurant, convenience stores and various shops. At Surfdale Beach you can enjoy a swim at mid to high tides. It is popular for launching your boat or taking out your kayaks or paddle boards. Little Oneroa is also a ten minute downhill walk to get to this fabulous little beach, with the gorgeous white sand and all day swimming of Oneroa Beach slightly further around the bend. Spoilt for choice, it is a 20 minute walk to the main Oneroa Village where you will find restaurants, cafes and an interesting variety of stores. You will also find banks, the library, our local cinema and theatre. Amigos can be found just off Pacific Parade, with bus stops for both directions within 200 metres of the villa. Features: Off street parking, gas BBQ, TV, DVD, BOSE SoundTouch (Bluetooth or AUX compatible), Free Wifi, heat pump, large fridge freezer with extra fridge in garage, microwave, and dishwasher, gas hob with electric oven, washing machine and dryer. Please Note: Bed linen & towels included in the per night rate. Additional - standard exit cleaning of $125 applies. Clean, beautiful, modern, quiet, convenient. Superb accommodation in a quiet spot with easy access to beaches. We had such an amazing stay at Amigos - a great place to go with friends and chill. Great location and is super close to everything. The photos don't do it justice at all and is even better when you arrive! This place is seriously amazing! The pictures don’t do it justice. It is decorated beautifully with lots of additional touches. A great space to chill, well thought out design with lots of areas to sit/drink. It only has one bathroom which I thought might be an issue but it was fine. What a gorgeous place and with a lovely view too! Incredibly clean, great space to hang out in when it's rainy (which it was). Tracy was very friendly and helpful! Highly recommend. We had a great stay at Amigos, loved the Mexican touch, even better than the photos! Styley well appointed house with lovely outdoors spaces for sunny and cooler days, great space for socialising. Super clean and lovely little sea view. We visited Amigos from the Gold Coast with our 3 teenage daughters. We had a most awesome time relaxing in this full sized Mexican themed home with lovely views. It was centrally located between town, vineyards and beaches. Great sized bedrooms and large kitchen and BBQ area for entertaining. Really was a home away from home. Thanks again Chris & Tracy for your hospitality, you guys rock! A well appointed, comfortable home welcomed us on our weekend in Waiheke. Spacious interior with great outdoor living. We loved our stay and will definitely be back. See you again Amigos. What a gorgeous feel arriving at this warm and charming Mexican influenced designed home. Great location, close to Surfdale Beach and restaurants. Lovely linen and cleanliness plus plus! Highly recommended!